← New Website and Blog. 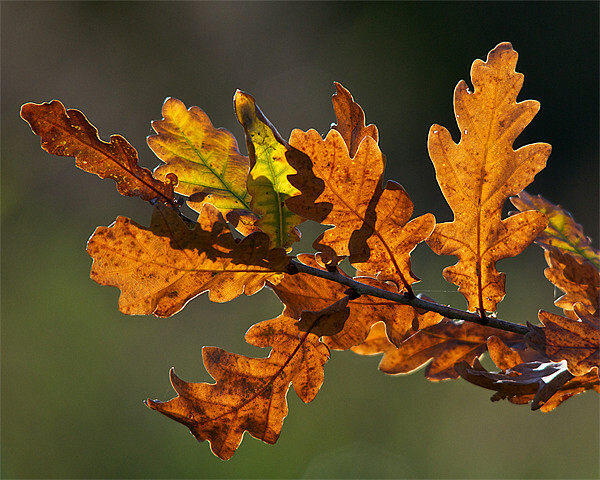 Oak Leaf Wine is a wine of the hedgerow. If you like to make your own Oak Leaf Wine, here is a recipe I would urge you to try at this Autumnal time of year. Oak leaves are a most unlikely ingredient. This wine will of course be different every time you make it, but if it is a good batch you will end up with a wonderfully fragrant wine that is the colour of amber and honey. You can make Oak Leaf Wine from the new leaves in the Spring but I choose not to do so. It always seems wrong to me to rob the tree of its new green leaves. In the autumn when the leaves are dying back anyway, I look upon it differently. The Oak leaves are a gift and I am not harming the tree. As always, you should pick the leaves from trees that are not affected by pollution, so away from roads and busy highways. Pick the leaves just as they are withering on the branches but whilst they are still on the tree. The leaves should come away very easily. The next gust of wind would surely bring them down anyway. And before you leave, make sure you thank the Oak tree for its gift of leaves. After picking the leaves I leave them outside in a wine bucket for a few hours so that any little living creatures can make their way towards the light and escape! So here’s the recipe: Ingredients: 2 gallons oak leaves 1 gallon boiling water 4lbs sugar 1/2 oz whole ginger (well bruised) 1 1/2 tsps. wine yeast. Method: 1. Put the picked oak leaves in wine bucket and rinse them lightly with cold water to clean them then pour the boiling water over. Leave standing for 3-4 days then strain and throw the leaves away (or compost). 2. Add the sugar and the ginger to the liquid and boil for 20 minutes. 3. When lukewarm add the yeast. Ferment for 10-12 days, then rack off and bottle. Leave in a cool dark place for one year to mature. Enjoy this wonderful wine of the hedgerow! Until next time, Sharon. This entry was posted in Recipes and tagged autumn, oak leaf wine, oak leaves, recipe. Bookmark the permalink.